POMONA, Calif. — With eight-time Top Fuel champion Tony Schumacher and Funny Car contender Courtney Force both out of action for this weekend’s NHRA Mello Yello Drag Racing Series opener at Auto Club Raceway, many have been wondering: Who will be racing at Pomona? 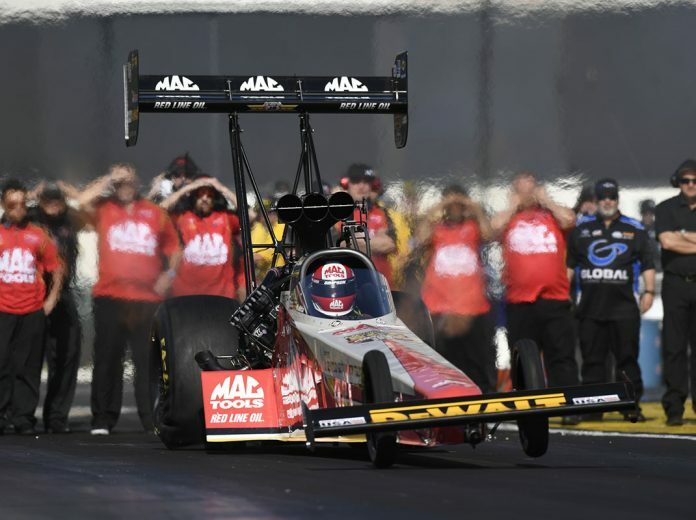 The current entry lists provided by the NHRA, show full fields in two of the three professional classes, with Top Fuel falling a single entry short of a field of 16. The class will be headlined by four teams entering two cars each. Reigning champions Capco Racing will field machines for Steve and Billy Torrence. Kalitta Motorsports (Doug Kalitta and Richie Crampton), John Force Racing (Brittany Force and Austin Prock) and Don Schumacher Racing (Antron Brown and Leah Pritchett) also have two cars entered. Others entered in the Top Fuel class are Scott Palmer, Terry McMillen, Clay Millican, Steve Faria, Cameron Ferre, James Marony and Mike Salinas. Seventeen cars headlined by 16-time series champion John Force are scheduled to begin Funny Car qualifying at Pomona. Force’s two-car Funny Car team includes multi-time champion Robert Hight. Don Schumacher Racing is scheduled to bring four Funny Cars to Pomona with Ron Capps, Tommy Johnson Jr., Jack Beckman and Matt Hagan all returning to the team. Reigning champion J.R. Todd headlines the two-car Kalitta Motorsports entry that includes former Top Fuel champion Shawn Langdon. The remainder of the Funny Car field includes Cruz Pedregon, Tim Wilkerson, Frank Pedregon, Bob Tasca III, Terry Haddock, Phil Burkart Jr., James Campbell, Jeff Diehl and the ageless Gary Densham. Ironically, the Pro Stock class, which has struggled with car counts and as a result will appear at only 17 of the 24 events this season, has the biggest field with 18 cars entered. KB Racing drivers Greg Anderson and Jason Line – both past Pro Stock champions – headline the Pro Stock field that includes Jeg Coughlin Jr., Erica Enders, Bo Butner, Shane Tucker, Alex Laughlin, Rodger Brogdon, Deric Kramer, Alan Prusiensky, Kenny Delco, Matt Hartford, Joey Grose, Steve Graha, Val Smeland and Jeffrey Isbell.